Sour and spicy flavours and a mystery recipe | Where to next? I’m a sucker for sour, bitter and spicy. Give me lemons, limes, grapefruits, kiwis, chillies, garlic, olives, Campari, and I’m happy. 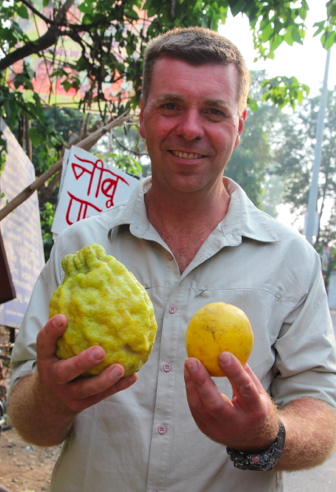 So you can imagine how a giant lemon caught my eye at a fruit stall in northern India. It was huge. We all oohed and aahed over it. Gary held it up for display and photographs. Seriously, it was the biggest lemon any of us had ever seen. But it had a kind of funny shape and as soon as the fruit seller cut it open, I knew it was a pomelo. 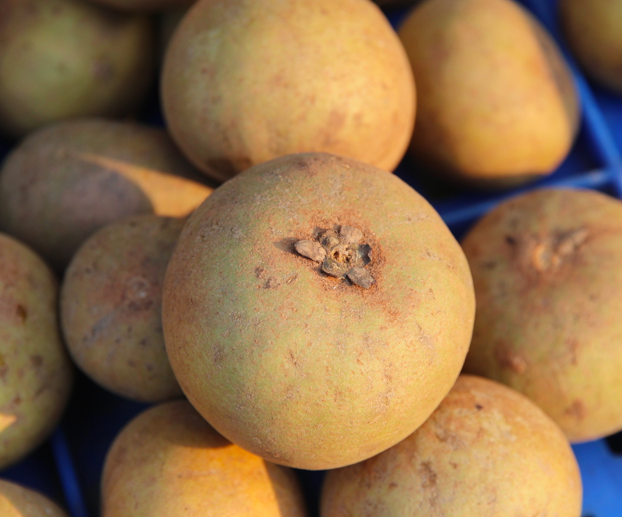 I first encountered this delicious fruit in the 1980s when we lived in Rangoon, Burma (or Yangoon, Myanmar if you prefer the current names). A pomelo is a slightly sweeter, less bitter and milder version of grapefruit. The flesh is paler in colour. It’s the largest citrus fruit, and can weigh up to two kilograms. I once bought a bushel basket of it from the ‘Pomelo Capital of the World’ in Burma, but that’s another story. But obviously, I love pomelo and was completely intrigued when the fruit seller said he’d make us a special pomelo drink. He put together a free sample and we all had a sip—fantastic! We were heading off to another place, but promised to return after lunch to purchase some. We always tried to honour our word, so were back soon enough. I’d have been disappointed if we’d missed it. 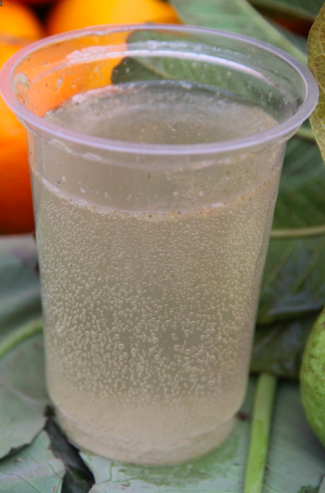 It’s probably one-quarter pomelo juice, topped up with soda (fizzy) water. Then he added a little sugar, some grinds of black pepper and a dose of chaat masala—a popular spice mixture that Indians sprinkle liberally over lots of food. The drink is fabulous. So delicious, so refreshing, and so secret. The fruit seller won’t reveal the chaat masala recipe. It’s his grandfather’s recipe—says it only has four ingredients when most chaat masalas have many more—and only his young son will learn the magic. Said son was helping dad that day and smiled broadly when he heard this news. You can’t argue with that family approach to business. I asked the fruit seller (mind you, he didn’t speak English so this conversation was through Deepti and Anand) if he’d ever thought to mass-produce the chaat masala. Yes, he had, which was another reason he kept the recipe secret. His fruit stall was interesting for a couple of other reasons. 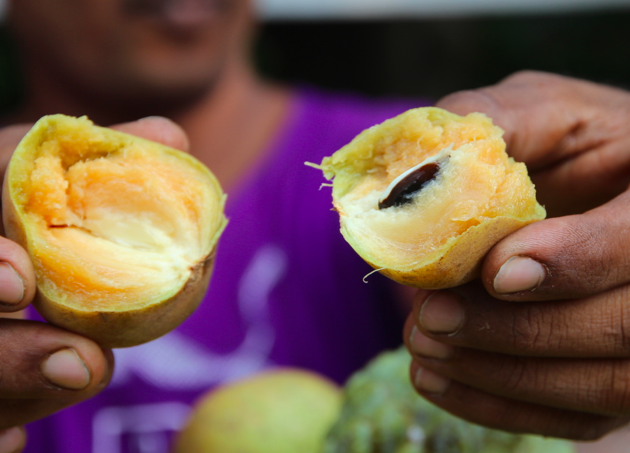 He was selling two fruits I’d never seen before in my travels—one was zapota (a soft fruit) and the other was a berry-type thing that I’ve now forgotten the name of. 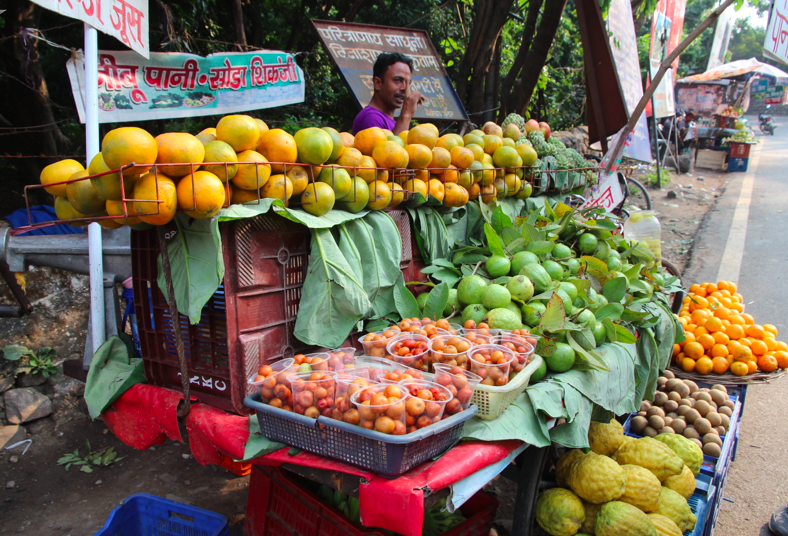 He also had custard apples, another fruit I knew from Burma, and some standards such as oranges and guavas. Two asides. Our pomelo drinks cost 36 cents each. What a bargain. And I found a recipe for chaat masala. It’s by Sanjeev Kapoor—India’s leading TV chef. It has nine (not four) ingredients, but here it is. I’m guessing that chillies, amchur powder and cumin seeds are three of the four ingredients in the fruit seller’s recipe. He did add pepper (and maybe salt) separately. Place a small non-stick sauté pan over medium heat. Add the coriander and dry-roast until lightly browned and fragrant. Transfer to a bowl. Transfer to a spice grinder. Add the chiles, black salt, citric acid, amchur, table salt, and pepper. Grind to a fine powder. Store in an airtight container. And if you are interested in recipes, be sure to check my food blog. ← Drinking in India—what’s your poison? And news of a miracle cure! Peggy, your story about these tropical fruits is bringing me back to our past holidays (ages ago!). From the fruits photos you posted here, I love most the custard apples. We had these for the first time in Thailand, where they had been called “noi nää” (or something like this). They are so sweet and the smell the smell I would describe it like apricot but with a touch of jasmin flour. mmhhh! I love custard apples too. Also fond of mangosteens and rambutans, actually I like lots of tropical fruits. We can buy many of them here in Australia, but the flavour isn’t quite as good as those purchased in the actual tropics. They were selling pomelos at the Fyshwick Markets this week-end (Trugold stand). I didn’t know what they were but now that I do, I hope they still have them next week-end. Like you, I like citrus fruits with the exception of grapefruit. so a slightly less tart version may be just right! Thanks Michael. Wish I could remember the name of those little orange berries which, by the way, tasted terrible. Okay Peggy; you’ve convinced me. I’ll make a trip to the markets this weekend in the hope of finding a pomelo. I think I will too. I bet they aren’t cheap. At Trugolds at Fyshwick they were in a basket by the cash registers, across from the capsicum. Didn’t notice the price.